Your holiday properties, Wynola and Big Wednesday, are both beautiful Queenslander-style properties filled with history and character. How did you manage to stay true to the properties heritage, though give both a new lease of fresh, modern life? Wynola for us was an instantaneous connection. We met her in a Queenslander ‘graveyard’ and fell in love. 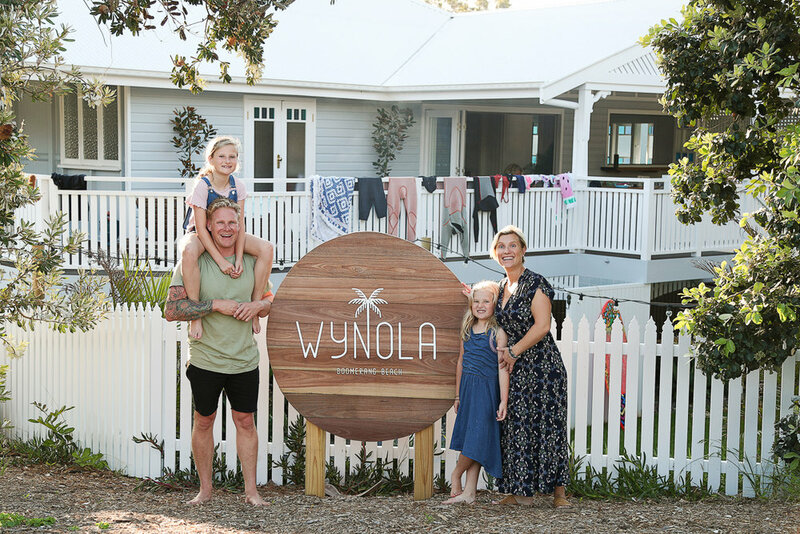 So the journey for us was one that we wanted to share with our guests, as knew that Wynola’s heritage was part of her appeal – she just needed to step back into the present day with a modern look. Big Wednesday was our second property, also a Queenslander. As we had such a positive experience bringing Wynola back to life, we knew our renovating team could do the same for this smaller-scale Queenslander in an incredible spot at Crescent Head. There is a grand, yet casually elegant feeling about Queenslanders, so we wanted to retain this look and feel or our guests. We didn’t actually do a lot of physical knocking down of walls, more beautifying what was already there. The end goal was sharing our love for these properties with others, creating a place where guests could disconnect from work and everyday life, yet reconnect with their holiday surrounds in a calm environment filled with love. Wynola was relocated in four parts, on the back of a semi-trailer! Did this cause a stir with the neighbours? Absolutely! We caused chaos in the streets for a week as jigsaw parts of Wynola were placed onto the footings at their new base at Boomerang Beach. All the locals were stopping to watch, asking us questions, while we were still working it out ourselves… so the pressure with all eyes on us was pretty intense. I believe there may have been a few people who doubted the end result, after seeing Wynola in her early days. So from the very beginning, the pressure was on us to ensure we did justice to the property that was located in a central spot at Boomerang Beach for all to see. If we created an eyesore, we would never have lived it down. What has been your biggest challenge so far, navigating a new industry, as a holiday home owner? Restoring and styling Wynola was the easy part. The challenge was setting up all the time-consuming, back-end administrative tasks. For example, picking the reservation system to use, setting up booking contracts for guests that kept in mind all legalities to ensure we were covered across all scenarios, creating check-in manuals for guests, setting up Airbnb pages and creating content, meeting local operators so, they knew of us and were happy to welcome our guests… the back-end is the backbone of the business, yet it can take a while to get up to speed and all prepared. What advice would you give to others wanting to create a holiday home? I’m still new to this industry, though a piece of advice that resonated with me… what you put in at the beginning, you will get back. Many think that setting up a holiday home is easy peasy. It’s not. Preparation in the early days before you open to guests is vital, as you need to start on the front foot. You need to ensure all the legalities are in place, that your booking systems work, that your house manuals are looking fabulous and ready for guests, that you have a marketing plan to engage with your target market, and that you have researched your price point well so, you’re entering the market at the right price to attract the right guests for you. Lastly, reach out to your local community. Make contact with all the local operators where your holiday home is based, whether it’s the cafes down the road, the local tourism organisation and independent businesses – you want to be on their radar, so they can recommend you, and so that you have welcoming locals on your side as your visitors start to book in and want to seek out experiences further afield. A tourism business is only as good as its local community.